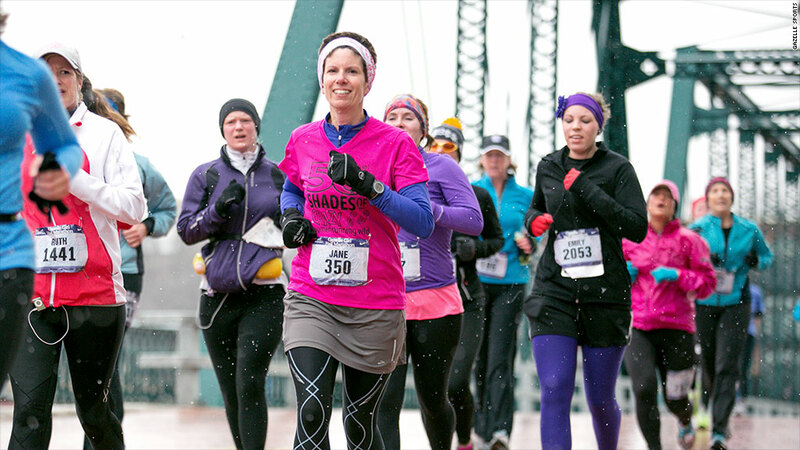 In Michigan, Gazelle Sports sponsors fun runs as part of its "local first" campaign. When Betsy Burton first started talking about the importance of buying local, no one really seemed to care. "People thought we were a bunch of whiny little businesses," said Burton, a co-owner of The King's English Bookshop in Salt Lake City. "Now, they see the devastation that's been wreaked not just by the chains, but by the Internet -- which is far more lethal." She helped found Local First Utah in 2005, just as similar groups were emerging across the country. Today, the number of groups promoting "local first" or "buy local" campaigns is at an all-time high. More than 150 business alliances from Austin, Texas, to Portland, Maine, encourage community members to buy from independent, locally-owned businesses. Now, Burton's customers thank her for being there. "That's the message we were trying to get out: We are the backbone of the community," she said. Stacy Mitchell, a senior researcher with the Institute for Local Self-Reliance, believes there's a growing sense that the big corporate economy no longer works. "There is this larger, cultural shift ... to buy local," she said. The movement gained steam during the recession. "Rather than pulling back and buying into the idea that they could save a few bucks elsewhere, in many communities, people seemed to make even more of an effort to steer their spending to businesses owned locally," she said. Since Chris Lampen-Crowell joined the West Michigan Local First organization, he saw sales at Gazelle Sports increase an average of 8.3% annually between 2007 and 2012. Though he doesn't credit Local First solely for the success, he thinks it was a key piece at a time when buying habits were changing. "Being part of Local First connects me and our employees to other people that care about West Michigan and our local economy," said Lampen-Crowell, a co-owner of the specialty running and fitness shops. The business alliances generally require their members to pay dues, and in return, provide signs for the storefront and support on educating customers that buying from them means choosing local. In 2013, Local First Utah collaborated with the American Booksellers Association on an economic impact study, which found that 55.3% of revenue from locally-owned businesses goes back to the local economy versus 13.6% from national chains. Last November, Local First Utah ran a "Shift Your Spending" week. The goal was for people to shift 10% of their holiday shopping toward locally-owned businesses. Nearly 90 businesses participated. Many of these businesses try to set themselves apart by being actively involved in the community. Lampen-Crowell offers free clinics where doctors and physical therapists do medical evaluations and he organizes fun runs known as urban herds. In Austin, one bookstore runs literary camps for kids and a pen pal program. But the businesses know that being local is not enough. "You have to provide actual superior customer experiences," said Steve Bercu, a co-owner of Austin-based BookPeople, which saw its highest sales ever in 2013. "If you don't, nobody cares if you're local."